Johannes Georg Bednorz is IBM Fellow at the IBM Zurich Research Laboratory. He completed bis undergraduate studies at the University of Miinster in 1976, and received a Ph.D. degree from the Swiss Federal Institute of Technology in Zurich in 1982. Re joined the IBM Zurich Research Laboratory in 1982 as a Research Staff Member and was appointed IBM Fellow in 1987. Dr. Bednorz's research activities involve preparation, crystal growth and characterization ofhigh refractive oxide materials (phase transitions, quantum ferroelectricity), oxides with metallic conductivity and superconductivity, and development of high Tc superconductors. 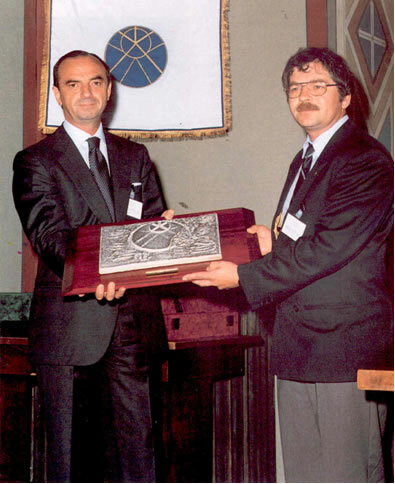 Together with Professor K. Alex Müller, he is corecipient of the Thirteenth Fritz London Memorial Award 1987 (presented by the Fritz London Memorial Award Committee, University of Califomia, Los Angeles); the Dannie Reineman Prize 1987 (awarded by the Minna James Reineman Stiftung, Academy of Sciences Gottingen, West Germany); the Robert Wichard Pohl Prize 1987 (conferred by the Prize Committee and the Steering Committee of the German Physical Society); the 1988 Rewlett-Packard Europhysics Prize; the Marcel-Benoist Prize 1986 conferred by the Marcel-Benoist Foundation, chaired by Flavio Cotti, member of the Federal Council; the Nobel Prize in Physics 1987; the 1988 APS International Prize for New Materials Research, and the Minnie Rosen Award, conferred by the Ross University, New York. He is also recipient of the 1987 Viktor Moritz Goldschmidt Prize awarded by the German Mineralogical Society, and the Otto-Klung Prize 1987 awarded by the Otto-Klung Foundation, Free University of Berlin, West Germany. In 1992 he has been appointed Distinguished Member of the World Academy of Ceramics. Marano Ticino, Novara, Italy, presents the official recognition of the Academy to Dr. Bednorz.